Carry your mobile devices for the everyday commute to work inside this sleek business tote bag. 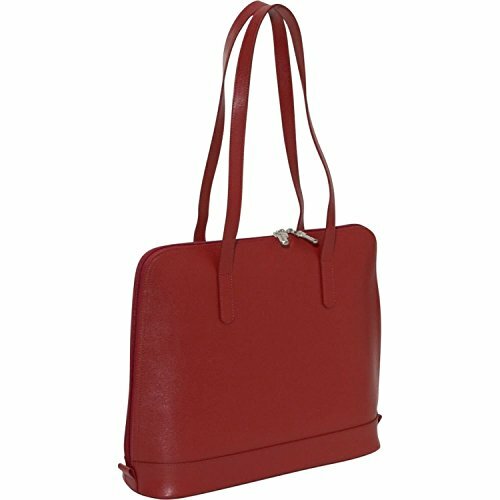 The Manhattan Business Tote bag is made from scratch & stain resistant Italian leather and features a structured design with long handles that make it easy and comfortable to carry on the shoulder. This tote bag has a roomy section with three-way zipper closure and a fully lined interior that includes a pocket for your iPad or tablet, an accessible organizer with pen holders, business card slots, and a pocket for your mobile phone. Handmade from cross-grain, scratch and stain resistant leather. Carry your mobile devices for the everyday commute to work inside this sleek business tote bag. Features a structured design with long handles that make it easy and comfortable to carry on the shoulder. This tote bag has a roomy section with three-way zipper closure and a fully lined interior that includes a pocket for your iPad or tablet, an accessible organizer with pen holders, business card slots, and a pocket for your mobile phone. Dimensions: 14"(L) x 11"(H) x 4"(W). Weight: 2.2 lbs.